In 1991, Romanow Container became one of the five founding partners in NewCorr Packaging, which supplies Romanow (and the other partners) with corrugated sheets. 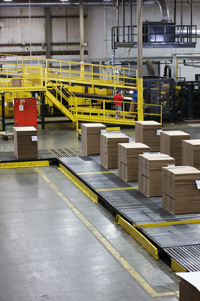 In 2000, NewCorr’s Northboro, MA facility was expanded to 165,000 square feet, and a second corrugator doubled its output capacity. It is now New England’s only corrugated sheet producer with two corrugators under one roof, and is the largest sheet producer in the Northeast. Not surprisingly, NewCorr is a three-shift, 24 hours/day operation. NewCorr Packaging’s ISOWA corrugators are unique in that not only are they efficient high-volume producers, they also excel at rapid setup changes; this enables cost-effective short-order runs as well as large-scale runs. NewCorr’s 87” corrugator produces E, B, C single wall and BC and EB double wall corrugated board. The 98” corrugator is dedicated to the production of B & C flute single wall corrugated board. NewCorr Packaging produces Mullen grade SW & DW board from 125lb test up through 600 lb test, as well as Edge Crush grade SW & DW board from EC23 up through EC80, in Kraft, Klay White and Bleached White papers. Why is NewCorr important to you, our customer? As a semi-captive supplier, NewCorr gives Romanow a high degree of control over the availability and price of its primary raw material. And that vertical integration translates to an assured and economical supply of quality packaging for you as a Romanow customer.